* This is my article in BusinessWorld last week. 1. User-pay principle via public-private partnership (PPP) means only those whose the service or facility will pay for its construction and maintenance. As a result, the rest of the population in other parts of the country will be spared of such cost. 2. All-taxpayers-pay principle means projects are paid by current taxpayers through the annual general appropriations act (GAA) or by future taxpayers through official development assistance (ODA). Taxpayers from Visayas and Mindanao will also pay for toll roads, dams, airports even if they hardly use these since these are located in Luzon. 3. It is not true that infrastructure projects funded by official development assistance (ODA) and/or taxpayers through the GAA are more beneficial to the public than PPP-funded projects. Iloilo Airport -- which was funded by ODA -- took longer to build and incurred cost overruns compared to the PPP-funded Mactan-Cebu Airport, which remains on schedule despite initial delays. 4. There are inherent problems and risks to the public under GAA- and ODA-funded projects since ODA funding normally has strings attached. Thus, a project funded by China ODA may require the government to hire Chinese contractors, suppliers, managers, and even workers. We now add more reasons why the Dutertenomics’ shift from PPP to ODA (mainly from China) funding of its build-build-build plan is unwise and risky. 5. In a Management Association of the Philippines (MAP) forum two weeks ago, finance expert Vaughn Montes cited the big contrast between ODA-funded Subic-Clark-Tarlac Expressway (SCTEx) and the PPP-funded Tarlac-Pangasinan-La Union Expressway (TPLEx). SCTEx took seven years from government approval to completion, two years delayed, and cost nearly twice at $32.8 billion vs. the approved budget of $18.7 billion or P341 million per kilometer. TPLEx cost only P61 million per kilometer. 6. Investor confidence in the Philippine economy has gained momentum compared to some of our neighbors in the region and it is not wise to constrain such confidence by ditching many PPP projects and shift to ODA and GAA funding. The expansion of FDI in the Philippines from 2000 to 2009 (last year of the Gloria Arroyo administration) was not significant (less than twice). However, during the same period, FDI expanded almost five times in Singapore, about four times in Indonesia and Vietnam, about three times in Thailand, Cambodia, South Korea, and Taiwan. 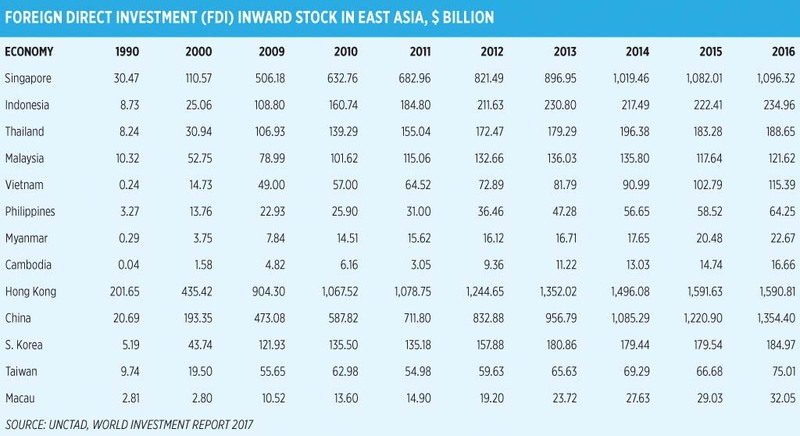 But from 2009-2015 or just six years, FDI in the Philippines expanded two and a half times while there was only two times expansion in Singapore, Indonesia, Vietnam, and Myanmar; and less than two times expansion in Thailand, Malaysia, Hong Kong, South Korea, and Taiwan. It is this kind of investor confidence and momentum that can greatly propel the Philippines into more investments and job creation, faster growth and infrastructure buildup. 8. The China government is the least trustworthy source of ODA funding considering that it is acting belligerently and aggressively in bullying the Philippines and other ASEAN neighbors that have claims over the many islands and islets in the South China Sea or West Philippine Sea (WPS). 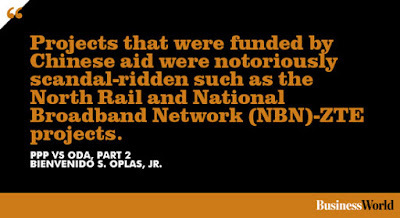 Note also that recent China-funded projects in the country were notoriously scandal-ridden -- North Rail and National Broadband Network (NBN)-ZTE projects. The insistence of the Duterte administration to compromise the income and savings of Filipino taxpayers -- even if there are many big private investors, local and foreign, that are willing to shoulder the costs and risks of infrastructure projects -- may result in shenanigans and large-scale corruption. And its consistent pronouncement of relying more on the money and contractors of the bully state across the WPS would further weaken the Philippines’ territorial claims to those islands and exclusive economic zone and weaken the rule of law. Honest minds in the Duterte Cabinet should remind the President of the economic and political dangers that it is treading on.